Due to its easy handling, the TOPCAT combines regatta sailing and sailing fun like no other class. The simple assembly and transport - whether on the car roof or a trailer - affords you the greatest mobility. Regatta sport at TOPCAT means competitive sailing among friends and at the same time holidays for the whole family. Advanced sailors will find challenges in the sport, while recreational sailors will find a community in which they can test their skills against the pros – the TOPCAT family. There are no barriers to overcome to get started, everyone is welcome. And ultimately, the sporting competition on the water is the best place to learn how to trim sails perfectly! The International TOPCAT Class Association – called ITCA – is a point of contact for regatta competitors and anyone wanting to communicate with other sailors. With over 1,000 members in 12 different countries, the ITCA offers the ideal platform for these activities. 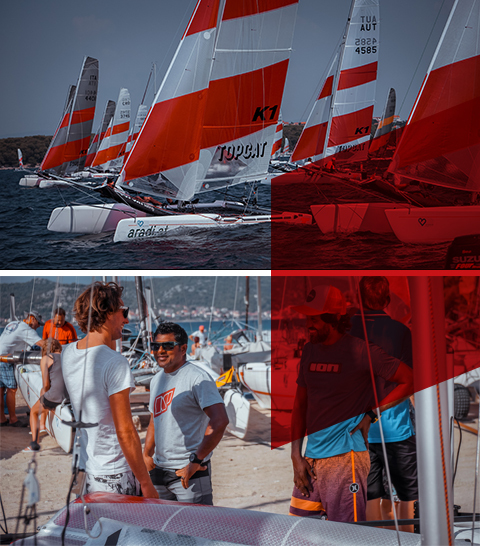 Under the aegis of the ITCA, regattas and championships are organised, training seminars are held, and world championships are coordinated. In cooperation with TOPCAT, the ITCA ensures there will be incomparable events for sailors and their families every year in fantastic locations all over the world. As an ITCA member, you can participate in TOPCAT championships and become part of the TOPCAT family. In addition, once a year you will receive the limited edition of the TOPCAT yearbook with many valuable tips and tricks and unparalleled regatta reports - unique in the sailing scene. You can find out more about the training sessions and events of the ITCA on the website of the Class Association. There is also a lively exchange between sailors in the interactive forum of the ITCA.